An elite military Guards battalion is growing breasts because of the way they drill, a military medical report had revealed in Germany. Dozens of soldiers in the Wachbataillon unit - which performs close drill displays at official events - are said to be stricken with a condition which stimulates male mammary glands. Experts say the repeated slapping of the soldiers' heavy rifles in the same spot on the left side of their chests during drills has stimulated the glands to produce hormones, causing breasts to sprout on one side only. The condition - called one-sided gynecomastia - has been diagnosed in 74 per cent of battalion members who presented to army medics with concerns over the growths. 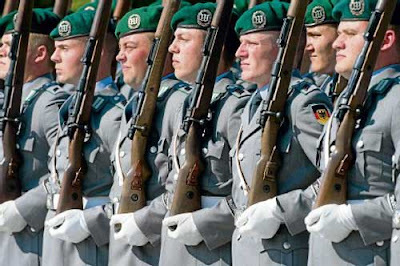 Director of plastic surgery at the military hospital in Berlin, Professor Bjorn Krapohl, confirmed: "There is a very significant link between the activity in the Guard Battalion and the development of the breast on the left side. They need to change the way they drill. The constant slamming of the rifles against the left hand side of the chest is clearly a significant factor," he added. Official figures show that out of 211 male patients operated on for the condition, 35 were from the elite Wachbataillon. Military brass have promised to research the condition and adapt the battalion's drills if necessary. An army spokesman said: "The affected soldiers are being medically supervised and treated individually." As long as they are right handed it will be fine. Now you guys know what you have to do so you can fondle breasts all the time.